Millions of doses of “acid blocking” proton pump inhibitor drugs are doled out every year, yet most doctors and their patients are completely oblivious to their unintended, adverse effects, which include increased risk for premature death. Economically, the boost these drugs represent to pharmaceutical companies cannot be overstated. With cumulative sales of more than $10 billion dollars annually, drugs like Nexium, Prilosec, Prevacid, and others, represent a significant chunk of Big Pharma’s profits. Despite clinical research that shows an act as simple as drinking more water reduces stomach acidmore than these drugs, and does so safely with no negative side effects, Big Pharma’s relationship with the corner doctor’s office too often prevents these basic self-help practices from being disseminated. The majority of people who take acid blockers are doing so because of dietary and lifestyle choices that create an unfavorable condition in the digestive tract. Poor quality food, consumed in rushed conditions, chased down with coffee or soda – what could go wrong? Just pop a purple pill to chase away the inevitable heartburn that follows. When pills are so readily available that help us divorce consequence from causation, these dietary indiscretions can become commonplace, even normalized. Side effects are rushed through in commercials, with the emphasis on “enjoy the foods you love!” presumably, with no downside. 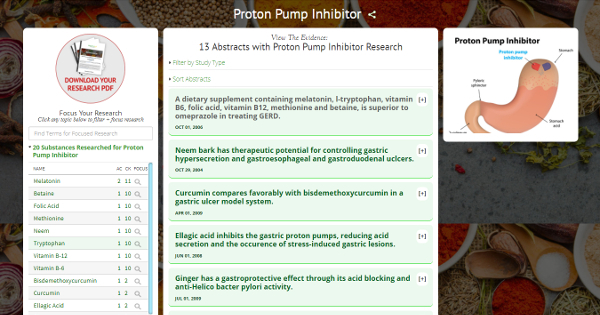 But the systemic effects of proton pump inhibitors are finally being recognized, and the action of these drugs is not merely isolated to the stomach. They affect the acid production of every cell in the human body. *Article originally appeared at GMI.